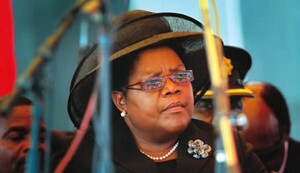 Can Joice Mujuru dethrone President Mugabe? Legend has it that she shot down, Rambo-style, a Rhodesia helicopter laden with soldiers; an extraordinary feat that catapulted her into the country’s post-independence history books as the first black female guerrilla fighter to have achieved such a heroic exploit in a war of liberation largely dominated by men. She went on to marry the revered army general, the late Solomon Mujuru, cementing her status as one of the pioneers of Zimbabwe’s liberation struggle. Ultimately, she became a cunning politician in her own right. In retrospect, some say her liberation credentials, particularly the downing of the chopper, could probably have been one of the reasons President Robert Mugabe made her the youngest minister in his first cabinet at the dawn of independence in 1980; and why she was also later parachuted to the post of second vice president of ZANU-PF and government in 2004. During her seemingly illustrious career in government, Joice Mujuru went on to hold several ministerial appointments, among them being minister of communications, in which she is remembered of her court battles with foreign-based business mogul Strive Masiyiwa. But critics remember that at her prime she rattled the rank and file of the main opposition Movement for Democratic Change (MDC-T), spewing vitriol against opposition leader Morgan Tsvangirai, who at his prime threatened the ZANU-PF political hegemony. In a typical monkey-see monkey-do style, she had no qualms in mimicking slogans denigrating Tsvangirai as she partook in ZANU-PF’s favourite past-time of verbally bashing the country’s opposition. As fate would have it, a decade later Mai Mujuru, as she is famously known, is now singing for her supper from the opposition corner after she officially launched her party, the Zimbabwe People First (ZPF) in February, nearly two years after being summarily fired from ZANU-PF and government on a myriad of real or imagined charges. Be that as it may, her entry into the murky waters of Zimbabwe’s politics is being viewed as a possible game-changer as she has categorically stated that she is gunning for the presidency at a time ZANU-PF is ravaged by factionalism as camps in President Mugabe’s party battle to succeed him. With ZANU-PF having already endorsed President Mugabe as its sole candidate for the 2018 polls; and with Mujuru set to meet her former boss in the ballot, questions abound if Mai Mujuri — who appears to have suddenly conjured up courage to challenge her former boss — has the political wherewithal to upstage President Mugabe at the elections. Having hobnobbed with the President and the who is who in ZANU -PF for the past 36 years, it is alleged that she is privy to the political secrets of how ZANU-PF has remained in power despite the real threat posed by the MDC, which surfaced on the political scene in September 1999. Some critics believe that she is what has been lacking in the opposition, while others claim her long association with President Mugabe and ZANU-PF would be her undoing, claiming she carries too much baggage to eclipse current opposition leaders as well as win the political hearts and souls of weary citizens. Tafadzwa Musekiwa, a former MDC legislator who fled the country for the United Kingdom after the violent 2000 elections, believes Mujuru is still tainted, citing his personal “persecution” in Mount Darwin where Mujuru was the longest serving Member of Parliament. “I witnessed the worst violence in Mt Darwin, the violence that completely changed how I view violence and violent people,” Musekiwa said, recounting his alleged ordeal in Mt Darwin. “For anyone to tell me Joice (Mujuru) is their choice is exactly the same as saying ZANU-PF is their preferred party, simple. What has changed besides the fact that she was forced to resign after falling out of favour with Bob (President Mugabe)? Mujuru allegedly attempted to thwart Masiyiwa, the founder and owner of Zimbabwe’s largest telecommunications company, Econet, from rolling out its mobile network. It required the intervention of the late former vice president Joshua Nkomo for Masiyiwa to be finally granted a licence in 1994 after protracted court battles. In one of her affidavits during the court battles with Masiyiwa, Mujuru referred to the late Father Zimbabwe as senile, something which critics claim would come to haunt her as she seeks to fulfill her presidential ambitions. At the unveiling of ZPF, Mujuru said citizens should let by-gones be by-gones, suggesting that she was sorry for dinning with the enemy for the past 36 years while the generality of the population wallowed in poverty. Some critics agree Mujuru has shown remorse as she appears to accept responsibility during her long stay in ZANU-PF and President Mugabe’s government. “Why don’t we go beyond our past and avoid a situation where a sad past prevents us from protecting the future,” said Juma Ulele, in response to the seeming growing support for Mujuru. Some opposition leaders are said to have done worse things than Mujuru in complicit with the ZANU-PF regime, knowingly or unknowingly. “Some even chose to refuse others tea on Mondays, marry from ZANU-PF, stay in a ZANU-PF strings-attached mansions and donate opposition seats to ZANU-PF,” added Jimmy Charowa, in a thinly veiled reference to Tsvangirai who usually had tea with President Mugabe every Mondays during the ill-fated Government of National Unity. Bekithemba Mhlanga, a political analyst based in the United Kingdom, who is closely following politics in Zimbabwe, believes Mujuru and her ZPF bring a new demission in the country’s body politic. “(But) it all depends on what Mujuru brings along. It also depends on the ZANU-PF that emerges from the current chaos. A strong ZANU-PF will match her pound for pound and defeat her. A weak one will lose if only those in the opposition who have squandered their political capital join in with her,” said Mhlanga. Ricky Mukonza, a political analyst based in South Africa, says sympathies for Mujuru have been emboldened by the death of her husband under mysterious circumstances in August, 2013, after his charred remains were discovered inside their farm house in Beatrice. According to Mukonza, the death of retired General Mujuru continues to draw sympathy from across the political divide because to date no satisfactory explanation has been given on how he died. “This gives her a sympathy card which she can always play to her advantage. Secondly, other than Mai Mujuru’s own credentials of the liberation struggle, General Mujuru — whether dead or alive, connects her to the war veterans and soldiers especially the old guard. “As a former leader of both ZANLA and the post-independence Zimbabwe army, Solomon (Mujuru) commands respect of the uniformed forces. I think there is nothing much that Mai Mujuru can do to cleanse herself of her ZANU-PF ghost. This is because this is her history and has to accept collective responsibility on things that went wrong when she was still there, more so that she was second in command. She has already asked for forgiveness and she must just hope that the public forgives her,” said Mukonza. But as she downed the chopper, can she topple the veteran Zimbabwean leader from power? We give her the benefit of the doubt, sympathisers say. Free & Fair Zimbabwe Election is the leading independent news source for politics, policy and elections in Zimbabwe.